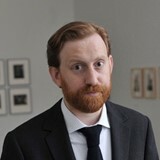 Simon Baker is Tate’s first Curator of Photography. Since his appointment in 2009 he has worked on acquisitions, displays of the permanent collection and exhibitions at both Tate Modern and Tate Britain, and in advisory roles for Tate St Ives and Tate Liverpool. Major exhibitions on which he has worked include William Klein + Daido Moriyama (2012) and Conflict, Time, Photography (2014). He has also been responsible, with colleagues, for establishing and running the Photography Acquisitions Committee and thereby overseeing the strategic expansion of Tate’s collection of photographs.